The Federal Reserve Bank of San Francisco published a letter about the labor market. The letter is titled, Gauging the Momentum of the Labor Recovery, and written by Mary C. Daly, Bart Hobijn, and Benjamin Bradshaw. They observe 6 indicators to judge how well the labor market is improving. 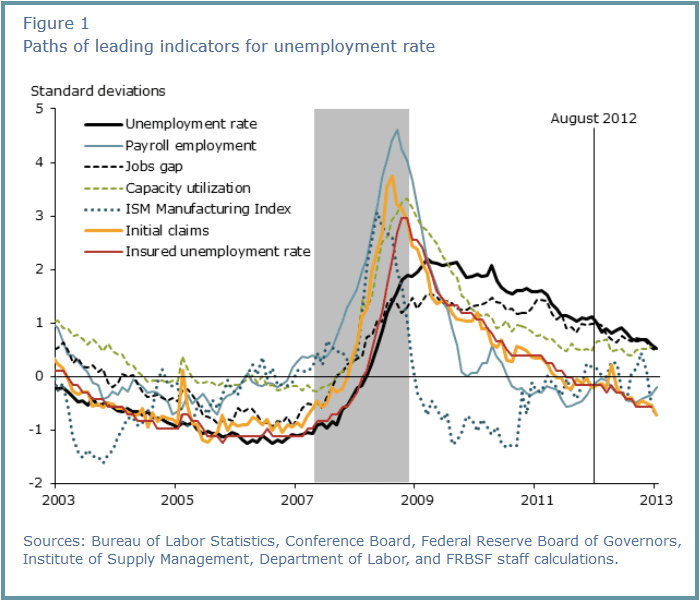 The 6 indicators are the insured unemployment rate, initial claims for unemployment insurance, capacity utilization, the jobs gap, the Institute for Supply Management (ISM) manufacturing index, and private payroll employment growth. I am left with the thought that “substantial improvement” is in the eye of the beholder. Yet there is another issue of how low unemployment can go. Will it go to the expected natural level between 5% and 6%? They write this in their letter. They very carefully give a warning here that the end of the business cycle is in sight. Here is the graph that they refer to in their letter. The indicators are returning to historic averages, but look closely. The bold black line of the unemployment rate itself trended below the other lines before the crisis. Now it is riding higher than the other lines as they return to their historic averages. The implication is that the unemployment rate has shifted higher. My view is that the natural rate of unemployment has shifted higher, and this graph supports the idea. The key indicator to watch is the initial claims. When this indicator shows signs of bottoming out, the unemployment rate will slow its descent. According to the slope in the graph, initial claims would start bottoming out in about a year. John Williams of the same Federal Reserve Bank of San Francisco predicts that the unemployment rate will be around 6.5% at the beginning of 2015. So if the indicators reach their historic low averages in a year, will the unemployment rate really get down to 6%?